This past Friday at Ann Arbor SPARK the CDE hosted Brian Hayden, cofounder and CEO of ShapeLog, to discuss the journey he and his team has had so far as a fitness technology startup. 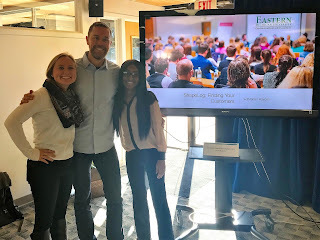 During the CDE's summer internship clinic, Hayden worked one-on-one with two marketing students to help them expand their digital marketing skills, while they offered Hayden and his team some fresh perspectives. The idea of ShapeLog came about when cofounder and CTO Nolan Orfield used his engineering background and curiosity to invent a gadget that would measure what you are doing when lifting weights. Today, ShapeLog has grown into a business-to-business fitness technology company with patented strength tracking hardware and the world's first strength training data API. Hayden explained that the team spent their first few months discovering and educating themselves about where this developed technology could take them. After narrowing their sales funnel to fitness advocates and gyms, they began to develop data on what exactly their product could measure. "Once we gathered an incredible amount of data and learned how to pitch our product, we dove right into reaching out to the top fitness companies in the world," said Hayden. Upon reaching out to those companies, ShapeLog discovered that 15 out of the 40 said they would be interested in learning more about the product they had created. "That was a turning point for us, and we knew we were on the right track when we had something those top companies were interested in," said Hayden. Since then, the ShapeLog team has focused their efforts on educating fitness providers about their technology and demoing their product at multiple trade shows. Additionally, they have demonstrated their determination and perseverance to continously with some of the top gymnasium chains in the country to demo their product. Currently, ShapeLog has a pilot program of their product in place at two Anytime Fitness' located in Ann Arbor and have been very happy with the feedback they have received. Hayden said, "It may have taken us a while, but we are finally on the right track.. Having a love and a passion for the product developed is what helped keep us going as a startup." For more information about ShapeLog, visit their website!